High performance and flexible white cementitious tile adhesive, with vinyl acrylic resins. Distinguished for its high thixotropy and flexibility, its zero vertical slip and its resistant to even constant moisture and frost. Once cured it is resistant to the creation of fungi. It allows for applications of up to 20mm without ‘sagging’. It has extended open time. Suitable for unbreakable tile-on-tile bonding, as well as surfaces made of concrete, plaster, waterproofed or not cement screeds, mosaics etc. 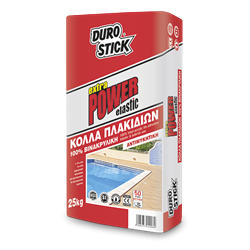 Recommended for installation of any type of tile, regardless of size, (klinker, cotto, gres, porcelanato, smaltato, glass mosaic, granite), even on building facades. Suitable for installations over floor radiant heating systems, athletic and swimming pools, as well as heavy traffic areas. Classified C2TE S2 per EN12004 and EN 12002.